Gramma maintains a large communal garden on the family farm, and it's frequently tended by all the surrounding families, sons, daughters, their spouses and a multitude of grandchildren. I think she maintains it more as a method of having the family gather, as she has a neat rule. And that includes everyone, right down to the little guys. Of course the adults all pitch in to help till and plant the patch, but of course, as every gardener knows, there's ongoing tending needed throughout the growing season, watering, weeding, hoeing etc. Miss out on the work and don't bother turning up at harvest time! That's where the kids come in, as everyone is expected to pitch in and do there fair share of weeding especially, so it's not uncommon some summer evenings to see 2 or 3 families arrive at Gramma's, with everyone pitching in for an hour or two, Moms, Dads, & children alike. Helping Gramma water with her Nelson 1865 Raintrain Traveling Sprinkler is pretty cool too! This summer, on a mid summer weeding outing, we noticed a lot of the new veges were getting "pruned", in fact in places chewed right off. At first we thought it was the littlest guys being a bit over exuberant in their weeding, but on closer inspection, this was more than mistaking a few plants for weeds, something was chewing them right off. So What Could Be Doing The Damage? As the farm is in a rural area, with an abundance of wildlife surrounding it, the first culprit to come to mind was deer, but deer leave "sign", hoof prints, droppings etc., but no sign of any deer presence was visible. On closer inspection, we did notice droppings within the garden area, but they were small, and no sign of any tracks. Of course we knew some rabbits were around, but we hadn't realized they'd multiplied so quickly. Now these posed a bit of a problem, as they're so darn cute, there was no way the grandchildren would allow any harm to come to them. Nor would we adults want to either of course, but something had to be done or we were soon going to have our vege garden stripped. There was no time to erect a rabbit proof fence, we needed something that was going to stop the nocturnal munching swiftly and effectively. That's when my childhood memories of trapping possums in my home country surfaced, though then we'd used the very inhumane leg traps. What about a live animal trap? They're about as humane as you can get! 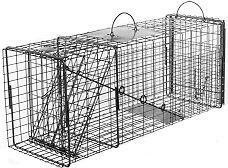 "A must have for trapping and or transferring raccoon, opossum, feral cats, rabbits, groundhogs, armadillos and many other medium size animals. 32in.L x 10in.W x 12in.H"
Simple in design, yet extremely effective in trapping animals without any harm coming to them, this trap was in the garden patch the very day it arrived. I recall back from my possum trapping days in New Zealand that the most effective bait was a paste heavily laced with aniseed extract, really pungent, but main was it good. It took a bit of finding, but we did find some in a local health food store, and the trap was baited with some old bread with a few drops of the extract applied. Not only one, but three of the little blighters safely huddled in the trap. I told you the aniseed extract was enticing! They must travel in groups, and I'm sure the scent of the extract had them racing each other to get at the prize! Now the biggest problem was what to do with them, but luckily being in a rural area, it was easy to just release them in some natural rabbit habitat at the far corner of the farm, a bushy area with lot's of lush vegetation and a little stream for drinking. Just one, then nothing! It seemed that even a few rabbits can do a ton of damage in a short time, and there was actually just a few of them, and I believe we caught them all in our new Live Animal Trap. Gamma's Happy, The Families are Happy! I'm glad we thought of getting our Live Animal Trap, as having the communal garden is a great way to bring everyone togther, and if we'd let the rabbits anniliate the vegetable patch, we'd have had one less reason to interrupt our busy lives, and thake the time to get together. And not one rabbit was harmed! The rabbits look so cute, it's almost a shame to trap them! Animal Live Trap is the one of best trick to catch animal. I read your story and really like it. If you want to know more so you can get more about <b><a href=http://korotraps.com>animal trappers</a></b> from our website please visit for more information. Are you afraid of sharks? Well, you shouldn't - here, you'll find out why.